Instead, Job responded, 'Praise the name of the Lord!' (1:21) 'Should we accept only good things from the hand of God and never anything bad?' (2:10) Satan lost his challenge to Job's righteousness. The story leaves the court of heaven and enters the council of humans as three of Job's friends come to sympathize with him. Their silent, seven-day vigil is apparently a genuine attempt to console Job (2:11-13). However, when Job breaks his silence with a bitter complaint (ch 3), his counselors begin to criticize and condemn him. In three rounds of debate (chs 4-27), their rhetoric varies from innuendo to blatant accusation. Job's friends argue that since God is righteous, he rewards each person according to what that person has done; therfore, Job's suffering must be the just punishment for some evil he has committed. To each of their speeches, Job responds by insisting that he is innocent and that his suffering is undeserved and unfair. After the three rounds of dialogue between Job and his friends, a poetic interlude praises God as the sole source of wisdom (ch 28). When Job has made his final statement about his misery and his righteousness (chs 29-31), his three friends give up on him, saying that he is too self-righteous (32:1). 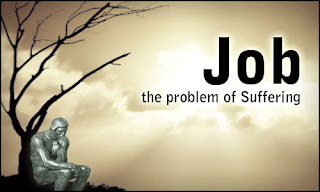 Elihu (a new voice) then renews the human struggle to explain Job's suffering (chs 32-37). Finally, God arrives to challenge Job (chs 38-41). Instead of hearing Job's case, God demands answers and demonstrates his own power and sovereignty through the question she poses. Job responds with repentance and acknowledges that he does not have the right to question God (42:1-6). Meaning and Message: “Though the book of Job does not clarify the meaning of suffering, it demonstrates that suffering is not necessarily God's retribution for sin. Job does not get an answer as to why bad things happen to good people, and neither do we. It is not the purpose of the book to explain suffering. The central conflict of the book is between the integrity of the Creator and the integrity of a man. Heaven and earth appear to be at odds. It is too easy simply to line up with Job's three friends in denying Job's innocence. We can appeal to various NT passages that deny that any human is righteous (e.g. ; Rom 3:10, 23; Luke 18:19), but Job's righteousness is genuine and thorough. However, his obession with his own rectitude sometimes borders on self-righteousness. He grows so adamant in defending his integrity that he seems ready to defy God. 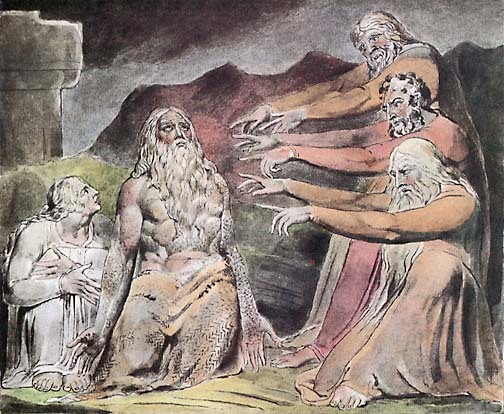 Job's three friends set out a view of God that is more orthodox, at least on the surface. These counselors are more than weak, imaginary straw men; they accurately develop most of the biblical ways of explaining suffering. Their theology is excellent, but their presumptuous applications go sour. They insist on a quid pro quo view of retribution, in which all the good and evil that people experience is directly related to what they have earned or deserved. In the end, God defends Job's innocence and rejects easy explanations of suffering. God also rejects Job's demands for an explanation. Since Job could not possibly understand the whole universe, he should not demand an explanation of how his suffering fits into that order. The world cannot be explained in terms that humans can fully understand. The way to live through calamities is not just to keep a stiff upper lip but to bow reverently before God and trust his soverign goodness. In the day of calamity, humans properly repsond to God by worshipping him and blessing him for the wisdom and justice of his ways, regardless of how harsh the pain or dark the confusion. God's holy purposes for human suffering are sometimes hidden. Yet in the end, Job draws closer to God through his suffering: 'I had only heard about you before, but now I have seen you with my own eyes' (Job 42:5).